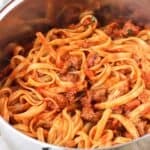 This spicy sausage fettuccine is a pasta dish full of delicious Italian flavors of marinara sauce, hot Italian sausage, garlic, basil, and Parmesan cheese. 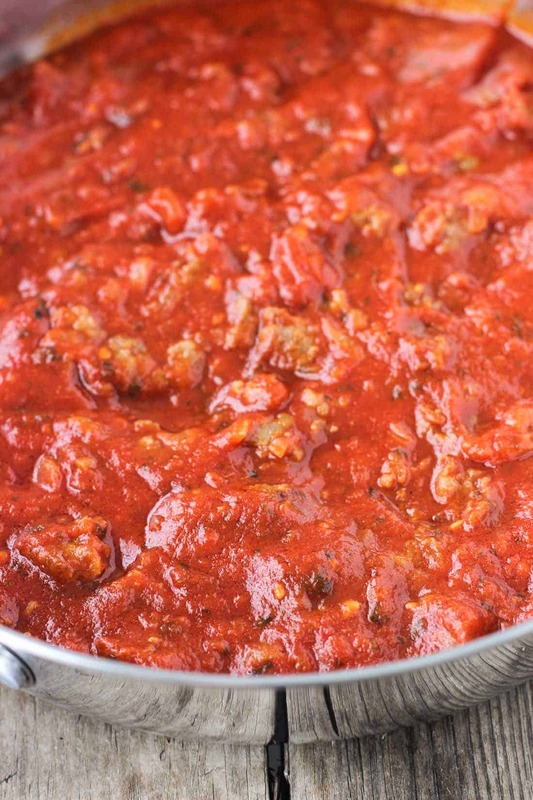 Sausage and spices are added to store-bought tomato sauce a semi-homemade shortcut. Perfect for weeknights! In order to up my accountability, I’m going to put this out there: my fly-by-the-seat-of-my-pants, list-making disorganization has gotten out of hand. Try as I might, I cannot, CANNOT, stick to one method and run with it. I’ve sprinkled my blog ideas, to-dos, and random thoughts across Evernote, iPhone notes, sticky notes, random notebooks, backs of crumpled receipts…if I have a pen in my hand, any surface is fair game. 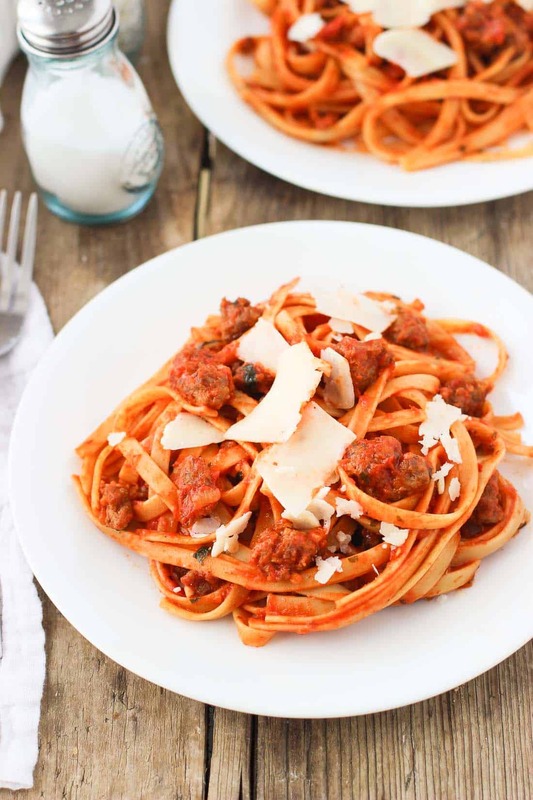 This spicy sausage fettuccine with basil and Parmesan is a satisfying pasta dish that gets a ton of flavor from the hot Italian sausage, which means less ingredients for you to add! This meal was in our rotation big time growing up. I remember getting so excited walking into the kitchen and smelling the crumbled sausage browning on the stove top. We never ate a bad crumb, of course, but this pasta was a favorite. Making homemade marinara sauce is such a treat, but starting from scratch after work is not going to happen unless you like eating at midnight. Umm hangriness starts setting in around 7:30 pm around here. Enter store-bought marinara for the weeknight win! I used a simple roasted garlic and herb variety, but by all means pick your favorite type. 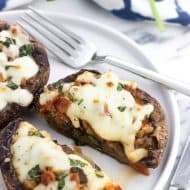 Depending on your flavor, you may wish to adjust the garlic and basil up or down depending. Heat olive oil in a large pan set over medium heat. Once oil is heated, add onion and saute for 4-5 minutes or until it begins to brown. Remove casing from sausages and add sausage to pan with the oil. Break up sausage into smaller pieces. Let sausage cook until it has browned and cooked through, about 10 minutes. Add tomato sauce and garlic to pan with the sausage and stir to combine everything. Reduce heat to medium-low and let sauce heat, stirring occasionally. As sauce is heating, bring a large pot of water to a boil, then add a pinch of salt and pasta. Let pasta cook for about 12 minutes, or until it's reached your preferred doneness. Drain pasta and return it to the pot. Pour in sauce and stir to combine. Stir in chopped basil leaves. 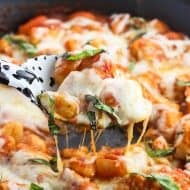 Serve with Parmesan cheese over top. 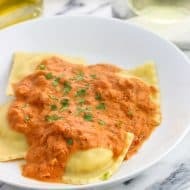 Use your favorite tomato sauce! 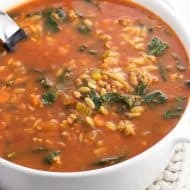 You may wish to increase/decrease the quantity of minced garlic and basil depending on your variety. 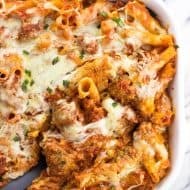 This sausage pasta looks fantastic! So easy to make, too! Saving the recipe to try it! 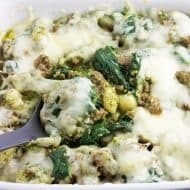 Love this sausage pasta! Comfort food at its best! Love the spiciness, so good! Great recipe, Alyssa! This has to be one of the heartiest pastas I have seen. All that sauce looks amazing and my mouth is just watering looking at the images! You’re not alone, I’m the exact same way! This pasta is definitely my kind of meal, I love anything with carbs. This looks so delicious, Alyssa! Okay! I am so with you – lime green post-it notes are everywhere! If you could see my desk you’d laugh – but I suspect you’d also feel right at home! Ha! I can’t believe how good I’ve gotten at writing so tiny! So this is my kinda meal! I grew up eating dishes like this 2 -3 times a week and could easily do that now! This spicy sausage is the best! That has happened to me more times than I’d like to admit. These days I”ve been putting the recipes right into my phone because (hopefully) I won’t lose it! 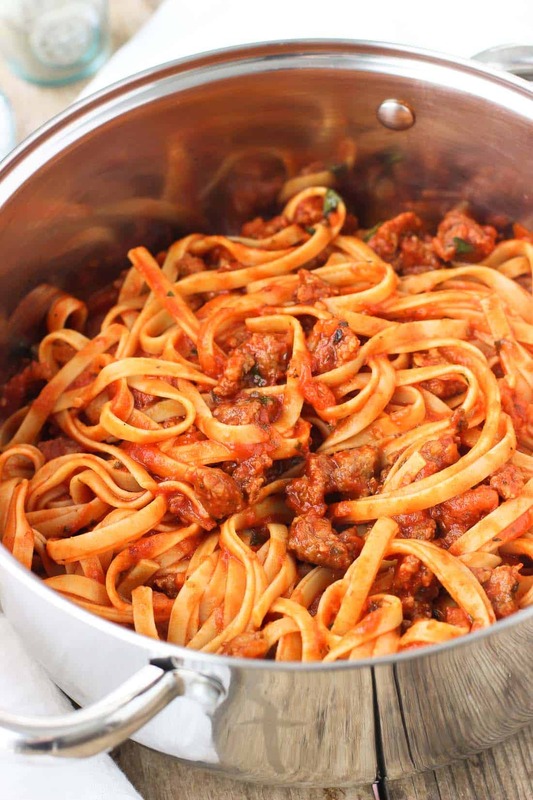 Love the looks of this pasta, especially with the sausage! YUM! That is such a good idea!!!! Oh man I need to start doing that. Thanks Nat!